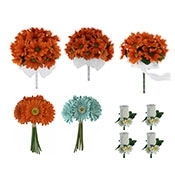 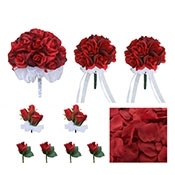 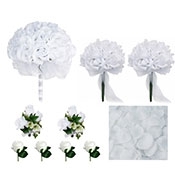 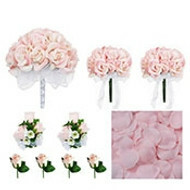 Cheap wedding bouquets packages with real looking fake flowers. Our 10 piece silk rose wedding package includes 3 artificial wedding bouquets + 4 boutonnieres + 2 corsages + 1 bag of rose petals. 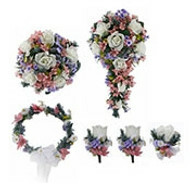 Our professionally designed fake wedding flower packages start at $99. Browse out selection of colors and find the perfect accent for your scheme. 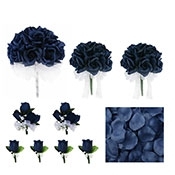 Deep navy blue roses, traditional red and burgundy, and bright and cheerful yellow and peach provide the perfect accents for any season and any décor. 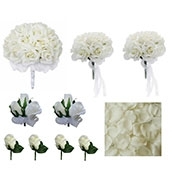 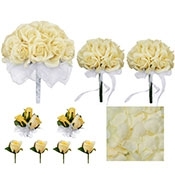 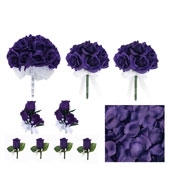 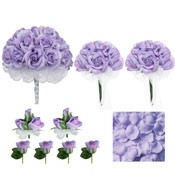 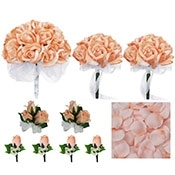 Our packages provide your wedding party with gorgeous silk flower accessories. 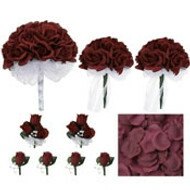 Corsages and boutonnieres add a flash of color to the bridal party. Silk bouquets are gorgeous and long-lasting ways to accent your special day.